After all the festival food, I am back with a healthy and vegan recipe today. It is Methi Thepla. It is a Gujarathi flatbread. 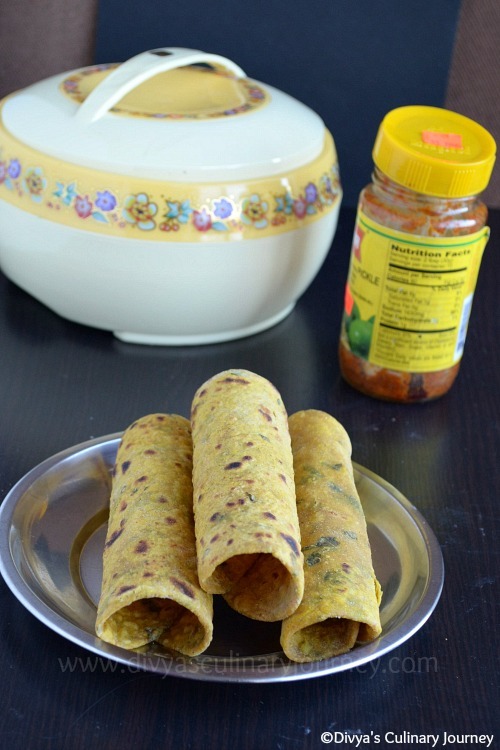 It is made with whole wheat flour and besan along with some spices and Methi (fenugreek leaves). It is very healthy and is soft and it stays good for a long time which makes it best for travel. 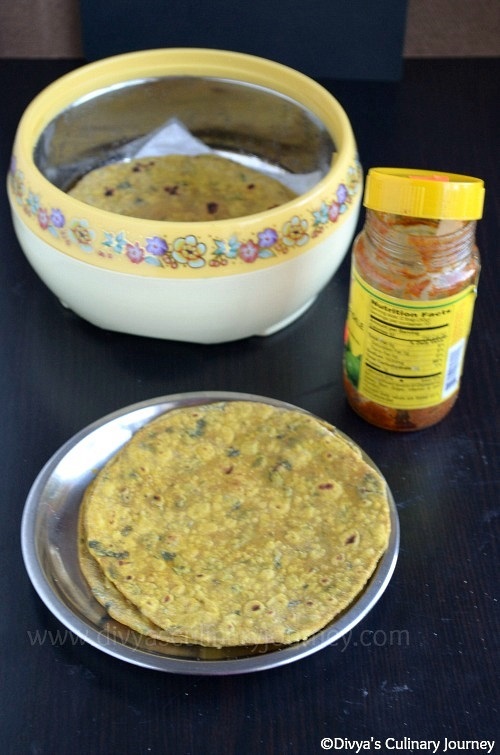 This methi thepla doesn't need an elaborate side dish , it can be had with pickle or raitha. In a bowl, add wheat flour, besan, Asafoetida, chilli powder, coriander powder, turmeric powder, cumin powder and salt and mix well. To this add chopped methi leaves and mix.Then add water little by little and keep kneading till the dough is smooth. To this dough, add 2-3 tablespoons of oil and keeping kneading till it is soft and smooth. Cover it with wet cloth and set it aside for 15 minutes. Then divide it into balls of equal size. Dust the balls as required and roll it into a flat bread. Heat a skillet and place the flat bread in the hot skillet, apply oil generously cook for a minute or two, then turn it to the other side and cook till it is done. Methi thepla is ready to be served with pickle or raitha. It yields around 15-18 theplas. In case you didn't get fresh fenugreek leaves, you can use kasuri methi/ kasoori methi (dried fenugreek leaves) too. Use only half of fresh leaf quantity. 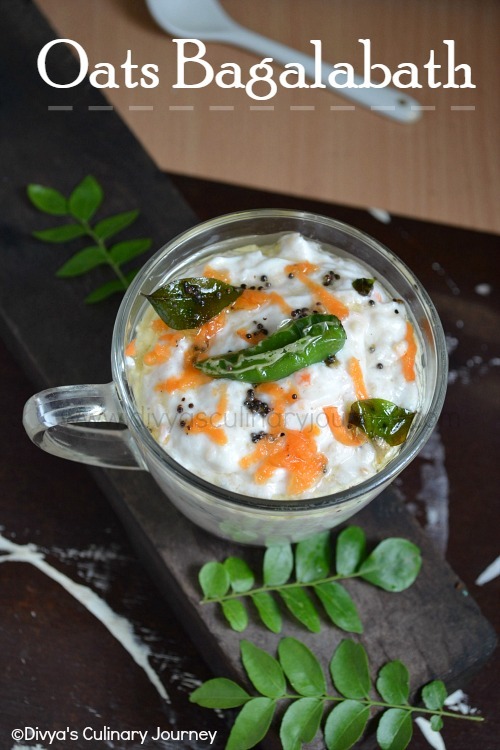 For example if you would add one cup of fresh methi, you can use half cup of kasuri methi. For more soft theplas, you can add 1/4 cup of yogurt to knead the dough, accordingly adjust the quantity of water. But I wanted a vegan version, so skipped using yogurt. That is a Healthy methi Thepla. Easy to make recipe made to perfection. Healthy iron rich and delicious flat bread..
Esto luce muy rico y muy elegante me encanta,abrazos. Healthy way to eat paratha..i love this tepla very much..awesome..
soft and healthy tepla...very nutritious and yummy tepla..my fav too :) liked ur set up..neat & inviting! Healthy and delicious theplas, one of my favorites..
Beautiful and perfectly made flats but both, the methi and fenugreek leaves are so rare over here. 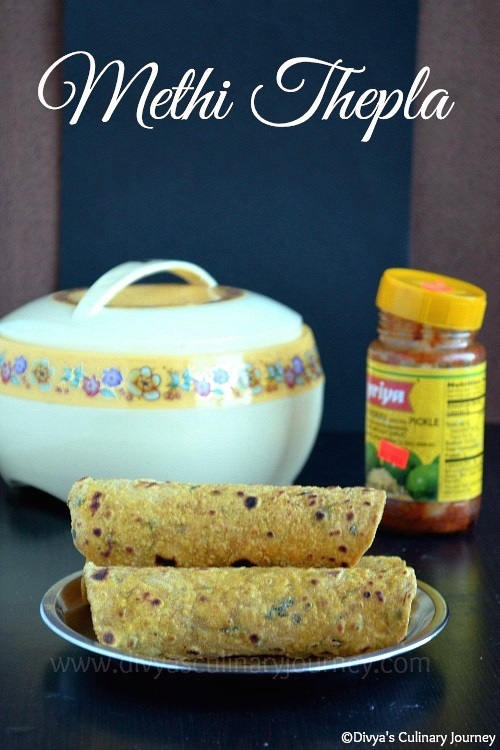 Perfect, soft and yummy theplas, always love to have it with pickle or curd.